Vera passed away in Perth hospital on Saturday, September 8th, 2018 at the age of 83 years. 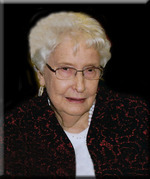 She was the beloved wife of Gordon Wallbank. Vera was the cherished mother of Janet (Bud) and Jenny (Scott) and step-mother of Dawn (Ross), Debbie (Allan) and Dyanne (Rick). She will be sadly missed by her mother Edith Mansbridge and her brother Ross Rowsell, all her extended family and friends. In keeping with her wishes, the arrangements are private for the family. Arrangements are in the care of Blair & Son Funeral Directors.